You’ll enjoy these custom Glock 45 holsters from Clinger Holsters. 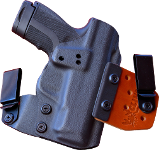 We design every Kydex holster from scratch to perfectly match your pistol. Our holsters will fit your G45 like a glove. You’ll hear a click when you holster your Glock to let you know it’s fully seated. You can adjust the retention on these Glock 45 Kydex holsters to get the exact amount of retention you want. More retention makes the pistol harder to click into and out of the holster. Less retention makes it easier to click into and out of the rig. It’s important in a custom holster to get the exact feel you’re looking for and you get that with Clinger. We use only the best Kydex for our products. Some companies try to use thinner Kydex shells in their designs. It’s easier and cheaper for them to make their inferior products that way but it’s not what’s best for the customer. We use thick Kydex shells in our Glock 45 concealed carry holster lineup to ensure you get a durable reliable product that won’t fail you when you need it most. We use superior American craftsmanship to build every holster we send out. We test fit every holster to ensure a proper fit. We want you to have a product that does what it’s supposed to do right out of the box so you can conceal carry worry free. We have multiple styles of Glock 45 IWB holsters. If you’re looking for a tuckable holster, our No Print Wonder is the best touchable rig on the market. If you like convenient and easy to use holsters, look at our Stingray and Comfort Cling lines. Our Comfort Cling is a clipless holster that uses just friction to hold your G45 in your waistband. We also offer Glock 45 OWB holster that conceal as well as an IWB holster. That may sound crazy but it’s possible because of our Cling Tab system. It utilizes a Cling Tab that pulls the grip of your weapon in close to your side while the Flex Tab bends with your waist. The end result is a very concealable OWB holster for your Glock 45 that is also very comfortable. The small footprint and Flex Tab are the reason it’s so comfortable. Clinger Holsters uses top notch workmanship and design to produce the best concealed carry products available. If you’re looking for incredibly designed Glock 45 holsters you’re at the right place.